Join us for a Twitter discussion about how to save money with your smartphone as you shop for gifts for friends and loved ones this holiday season and take advantage of Black Friday deals. With a wide selection of iPhones and Android phones, no contracts and no cancellation fees, Cricket Wireless aims to provide the best wireless plans at the best prices. There are no contracts, affordable monthly services and pay-as-you-go offerings—flexibility that meets your needs. 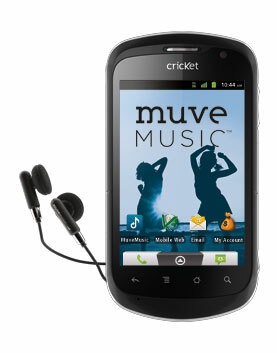 Cricket also offers Muve Music, a music service that puts millions of the hottest songs at your fingertips. It’s not just streaming. Unlimited song downloads are included in the price of the monthly plan, so you can take your tunes with you wherever you go. Enter for a chance to win great prizes from Cricket Wireless! RSVP by commenting below for a chance to win! Enter your name and Twitter handle. To be eligible to win you must RSVP and participate in the event using #CricketChats. We will randomly select two (2) winners from the entries. No purchase is necessary to win. Void where prohibited. U.S. residents only. Click here for the full rules. The holidays are so much brighter with chances to win with #‎CricketChats‬ and Techlicious.com! RSVP @rprive61204 :D See you soon! I’m in. Sounds like a great party!